Best 5 Swivel Recliners for your Living Room and Gliding Needs! It is the end of yet another long day at work and you cannot wait to get home, kick off your shoes and get into your comfy pants. The only thought on your mind as you drive home is a glass of wine for the heart and some good music for your soul. Oh, and the seat? One of the best swivel recliners on the market, that is what we call a relaxing evening. The Best will Serve you Longer! Naturally, you could be tempted to go for a cheaper brand as opposed to the high-end recliners. Well, it is all a matter of personal choice, but the best decision would be to invest in a durable piece of furniture. Now, that doesn't mean you have to break your wallet, it just means you have to do your research! Having a sturdily constructed frame will last you a long time and save you money on any repair costs. If your chair runs on a series of motors, you will need to keep them well maintained so that their operation remains smooth throughout your recliner’s life. 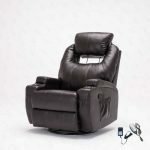 To find the perfect chair, we organized the top swivel recliners with the best features and quality construction below. Top 5 Swivel Chairs TODAY! Although the manufacturer is not clear on what material they have used for the frame, the overall construction of this recliner is sturdy. It has comfortable armrests thanks to ample cushioning and reviewers have praised its durability. It swivels 360 degrees, in a smooth, deliberate process. The bonded leather is soft, thanks to the underlying layer of polyurethane foam. It is available in both brown and black, colors that are fitting with the décor of most homes. Leather is easy to clean too, making is a viable option for parents and pet owners alike. This recliner has 8 massage settings, which range from mild to pretty intense. The vibrations from massage points distribute evenly throughout the chair and the keypad for selecting your settings are all within reach. It reclines to a 20-30 degrees angle, but to does not lay flat. The footrest is cushioned and extends when you pull the lever on the right side. It also has 3 pockets for your essentials; a large one on the right side and two small ones in the front. The chair also has a heating system, which works when you connect it's power. Overall, this recliner has great features, and it is well priced. The only misgiving is that you cannot turn on the heat without setting the vibrations off. This elegant microfiber recliner measures 37 x 30 x 41.8 inches. It rocks and glides which makes it appealing to nursing mothers and you will be happy to know that microfiber cleans easily. The chair comes in many colors so that buyers can get one to fit their nursery décor. The armrests are not the thickest, but they are comfortable nonetheless. The top part where you lay your head is quite broad and comfortable enough that you can fall asleep while rocking a baby. It is designed to rotate at 360 degrees in smooth operation. On the right side of the chair is a button for activating rocking and gliding that is better than footstools. The spring core foam filled seat is comfortable and even ideal for CS mothers. The footrest pops when you recline the back, and it is cushioned to give as much comfort to the legs as possible. Users like the comfortable, yet firm foam on the seat and back, at one of the best prices. The only downside to this recliner is the armrest could be wider. To find out more, read our full Mikayla review. 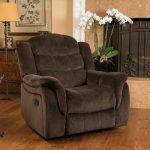 The frame of this sturdy recliner is hardwood and the fabric is a welcome relief from the norm: chocolate brown suede. It measures 22.5" X 21.75" and is quite roomy. This recliner’s armrests are broad and comfortable for people of all sizes. It is stuffed with foam underneath to increase comfort for the seat, armrest, back, and footrest. The springs are designed in such a way that the recline is based on your weight. It will recline all the way down but rise steadily if your weight is unable to keep it down. Over time, the springs ease up a bit to keep it slightly lower. The footrest is manually operated. The chair is a rocker too. Naturally, you will use your weight for this, as this chair is all springs and no electric buttons. 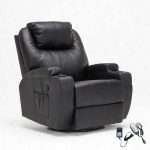 Since most of its operations are manual, you will need little or no maintenance for this recliner. Some of its best features include color, comfortable yet firm cushioning, manually operated recline, easy assembly, and the price. The only downside we see is the force it takes to bring the footrest down. If you aren't strong enough, you may struggle with this. Although this chair costs a little more than the others, it also has features that they may lack. It is made of wood and leather, with thick foam cushioning to make it firm, yet comfortable. It has three pockets; one on the side, and two at the front. The smooth swivel system takes it to a 360-degree turn, with the back being able to recline all the way. The armrests could be thicker, but they are quite comfortable from the foam in there. On each side of the armrest is a cup-holder. This recliner is heated all the way from the top to the footrest, which pops up when the back reclines. The back cushion is adjustable to accommodate a person of over 6’5 pretty easily. The Ergonomic Lounge Recliner is also a gentle rocker and a massage chair with 8 optimal settings. It has become increasingly desirable because of the amazing qualities that complete the overall package. The material and construction, its massage and rocking capabilities, the fact that you can recline it all the way to the back, and the washable material are all top-quality. Its price is the only downside, but this rocker is worth every penny in our opinion. 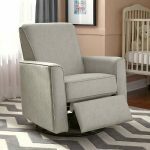 The Pulaski Swivel Glider Recliner is the perfect contemporary piece of furniture for living rooms or nurseries. It is has drop-in pocketed coils that prevent sagging, which gives consumers confidence that it will last longer compared to other chairs. 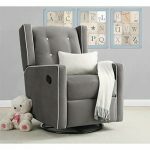 Furthermore, it has a soft padded back, seat and arms, and this is especially important for glider recliners because of the frequent usage in nurseries. Glider recliners usually tend to have older frames; however, the Pulaski has modern frame features, such as sleek arms and excellent details compared to recliners today. Furthermore, it provides a cradle like upholstery that will comfort you. This is due to its small scale, 360 swivel base and delicate reclining mechanism. High quality fabric makes the Pulaski easy to clean and super soft. The plush padding also makes it easy to kick back and relax while fulfilling contemporary decor desires. Lastly, it is not as bulky as other recliners in the same category. This was a huge bonus for folks looking for a chair to put in a tight spot. You have a choice between a power operated swivel chair and a manual one. Manual recliners use a lever release combined with your body weight to move into a position whereas a series of motors operate a power recliner. In most cases, a power recliner is preferred by people with physical disabilities who need help to get into to a sitting position. Some models will even allow the head and footrest to be placed separately. They are more expensive than manual recliners and they will most likely need some maintenance to keep the motors working well. Leather upholstery is almost unmatchable in quality and durability. Yes, it will cost more than leather substitutes, but it outweighs them in so many ways. Leather is also easy to clean and you will also have an impressive selection of colors to choose from. It is also why our leather recliners are so popular! You can also go for blends such as wool or synthetic, which are easy to clean and durable. Microfiber is comfortable, but might be a problem if you mind the water-repellent and anti-stain chemicals. You may need to factor in pets, if you have any. Size will largely depend on the available space. If you have a large room, then you can go for a recliner with an oversized backrest and arms. However, cozy spaces will call for chairs with a small footprint. A recliner with minimal clearance when fully opened is ideal for condos and apartments. Beyond the beautiful upholstery and boisterous backrests is the frame that holds your weight. This is far more important than any outer decorative aspect. Since the frame absorbs the weight from all moving parts of the seat, it needs to be made of hardwood and steel. Maple wood, birch, and beech wood are some of the material that makes up a frame that will endure for years. The bolts and screws should be sturdy too. It is not a recliner chair unless it has the accessories for it. A footrest should be noiseless, smooth in its operations, and cushioned for maximum support. It will either fold out when you apply pressure to the seat, or the recliner will have a lever on the side to manipulate the footrest. Higher-end chairs have an electric-operated footrest that works at the flicker of a button. High-end brands take it a notch higher and include a keyboard-style pad for you to manage the settings without working too hard. At the touch of a button, you can activate the massage option, ranging from mild to intensive. Likewise, you can adjust the height of your recliner, the sitting angle, the footrest, and a lot more. Some recliners are designed to be stationary, while others are rockers and gliders. Typically, rockers are more popular with nursing mothers but anyone else can use them too. This type of recliner will rock, rotate at 360 degrees (if you like) and glide. The design will be slightly different, as it will have a curve to accommodate all that movement. Rocking recliners are usually more expensive than their stationary counterparts. Wrapping it up - Editor's pick included! Finding the right swivel recliner for your home depends on a number of things. Factors such as design and comfort are very important but the structural frame and spacing are even more so. People often misjudge how large swivel recliners are. They are then disappointed when they realize that their brand new swivel recliner takes up a lot more space than they thought it would. With that being said, our editors pick is the Ergonomic Massage Lounge Recliner. It has all the modern features and has perfected its swivel base and movement.